I'm excited to introduce you to my latest piece! 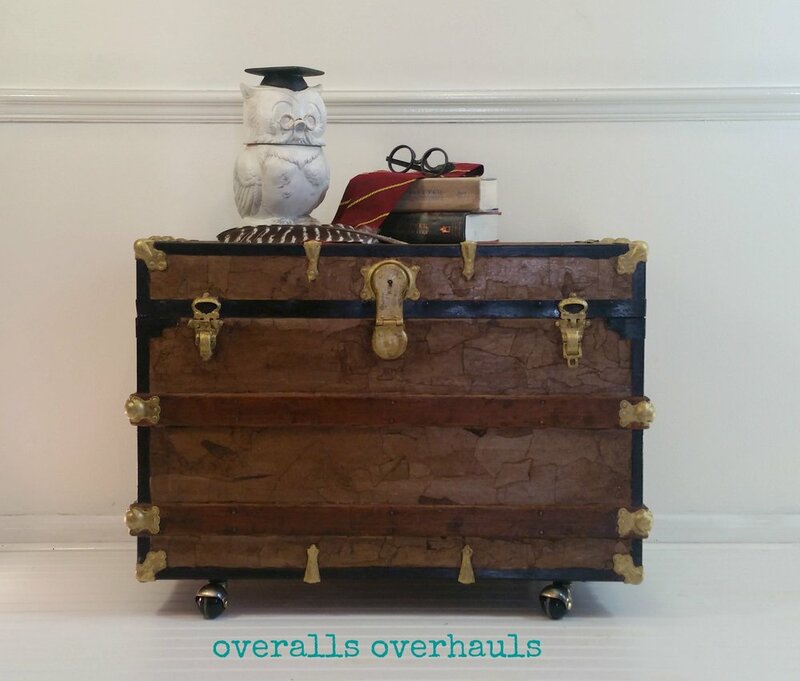 The "Magical Steamer Trunk." I started with something similar to this - not as much metal, though. I am trying to remember to take more before and during pictures. This is the finished product. Replaced the old really rusty built-in wheels with these casters. Refinished bits of wood, hardware and metal and adding a faux leather finish. I think it's adorable! Good for a coffee table - store games inside, end table, night stand or at the foot of a bed. The inside is the fun part! Distressed red lid with the Hogwart's crest. The lift out drawer that sits right inside the trunk is covered with portions of the Marauder's map. Here is a side view. The handles have been replaced and are decorative only. A better view of the lift-out drawer. There is a ton of storage here! Here is where my weak photography skills don't do justice. The inside of the trunk is lined with distressed pages of the 7th book. It's smooth inside - believe it or not. And, there you have it! If you have questions or want to see something up close -leave a comment!